Time Card is the document that provides an appropriate curator co-driver at the beginning of each section where the rally is divided (and collected at the end of it) which will be reflected inter alia annotations of the hours in which the participant was presented in the various controls carried out by the organization during the course of the test. Its loss entails the exclusion of the rally, so it is advisable not to leave him in no time. It is the most important document. No pacenotes you can run (although we fear that will run slightly) without Road-Book you could even play test following any participants not to miss on the route, but without time card organizer may not be aware of your performance throughout the test and therefore not allowed to continue in the same. In the case of neglect, this time card must be delivered to the vehicle that closes career thus formalizing the withdrawal of test equipment. – Number of previous vehicle has taken from the special stage. – The number of participants that owns the license control. In addition to these previous entries, there are boxes designed to be the passenger himself who enter the time you think you have to enter the control and deliver the card to the stewards after making appropriate amounts of time (in the example are represented on yellow background). At the time card show up on a background of another color and expressly states that are “for use by the participant”. Besides the co-driver should check the entries that make the commissioners on the card if you think there is any incorrect entry to claim asap. If a section is interrupted and match that you are already in the special stage, we will make use of the boxes reserved for this course in which they scored in the Stop Control section a new time you will have to add a new time sector facilitated by the organizer and calculated according to the distance remaining to be filled by sector (Casillas in the example shown appear on red background). In case you have to follow the alternative route marked by the organization, we will score a tee time at which one must add the time allotted by the organizer to this alternative route. 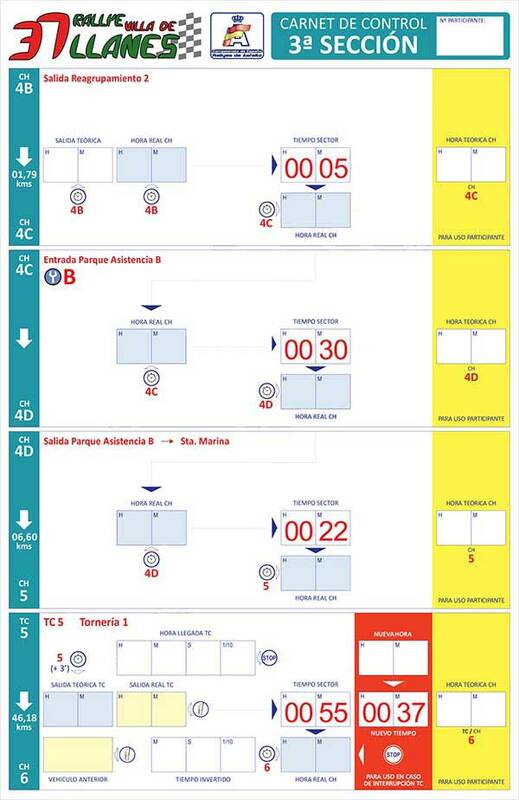 At the end of the section (coinciding with the entrance to a regrouping or the end of the rally) the time card will be given to the commissioner to lead such control and we replace (if not final rally) with a new one in which will be indicated the starting time participant to the next section. To make good use of the time card (or time card) must be clear about the operation of controls times we encounter during a rally. This will be a section will detail shortly to move forward with other issues that will try from our website.